What a delight to start a day with a happy surprise. Veronique of French Girl in Seattle sent a blogging award my way ! for "bloggers who positively and creatively inspire others in the blogosphere." Yippi! Wow! Thank you so much dear Veronique for your kind and sweet words. Whenever I open your post I always find tons of interesting travel tips, funny characteristics or a quite thorough research to support an interesting topic. And how sweet of you to answer individually to every comment and visit your virtual friends to leave words of support. As I'm new to blogging I already have a few dear virtual friends and even if I don't always comment, I still try not to miss the posts. They all are very inspirational in their own way. Catherine http://www.cashmerelover.com - brings a few beautiful thoughts and images for a day. Virginia Blue http://blog.glamourdrops.com - oh, how I love her glam series of Cocktails parties, Gems of the month, Rescue me, and always some design discovery, ideas and great imagery. Virginia Jones http://paristhroughmylens.blogspot.ca of course, for my Daily Paris smile. She was so generous to introduce me to a blogging community. Carla Coulson http://carlacoulson.com a very talented photographer and generous mentor always eager to share her experience and passion to photography with fellows bloggers. Francine Gardner http://fg-artdevivre.blogspot.ca for chic and glam interiors and tireless quest for decorating ideas and talents. Wolfie http://dailyplateofcrazy.com Big Little Wolf's Daily Plate of Crazy, just the name of the blog tells it all: sharp shooting topics aiming to the core, daily reality check. It is my great pleasure to follow the rules for recipients and name 10 bloggers who deserve the Award and link back to their blogs which in return is kindly expected of all the nominees: to name 10 blogs they love and invite friends to visit. I'd like to excuse myself from answering 10 personal questions to save your precious time my friends. But ask me anything in your comments and I'll reply. On the other hand I have so much to do before leaving for vacation I'm so anxious about. Next Monday we're going to Paris/Strasbourg for two weeks! Lot's to be done before we leave. There's no need to tell that packing for pas de trois to travel light is much more tricky than travel heavy and throw into large valise whatever seems to be needed on the trip. First I have to make three piles, than I have to edit, deduct and subtract. That leaves us with a fair equation: one suitcase for me, one for my husband and son to share. Who wouldn't think it's only fair? The junior will have a carry on with cameras, tripod and stuff. Thank you for reading and visiting the nominated blogs. I'm sure you'll enjoy them as much as I do. May I wish you all a wonderful summer. Thank you dear one for the honor!!! I am thrilled that you will be headed to Paris and Strasbourg and can't for your new photos. Hooray! Oh Natalie, you always bring me so much happiness, so much of just the best of you--I don't need another award! You are already such a gift just as you are. And while I am sad that we won't meet up this time, I hope it won't be the last opportunity, either on your continent or mine. And in the meantime, if there if anything that I can do to make your visit better, please don't hesitate to ask! Travel safely and merci, merci encore!!! Thank you so much for your sweet words about my blog! I so appreciate it! 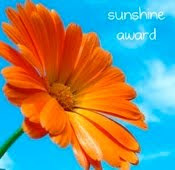 And I feel honored that you pass the Sunshine Award to me!!! Thank you! Now I have discovered your beautiful blog! I was browsing into it and saw all your beautiful posts about Gaudi and Barcelona! Fabulous! Thank you dear friends and I wish you all a wonderful time. I came here from our mutual friend Heather, Lost in Arles. I love your blog and I am your new follower. Enjoy your vacation and I look forward to knowing your blog.